VITA FREAK TM PACKS are engineered to provide your body with the absolute highest-quality vitamins, minerals and micro-nutrients available! If you expect your body to have superior-quality health, then you need to provide it with superior-quality nutrients. VITA FREAK’s gold-standard formula is designed to optimize every aspect of health and prime your body for greater performance, muscle growth, strength and recovery! VITA FREAKTM is a multi-vitamin/mineral stacked with 7 to 8 other health-promoting supplements! Nothing is more complete! To ensure accurate dosing of every ingredient in each VITA FREAK Pack, the 10 different ingredient complexes are strategically divided into 2 white tablets, 2 green tablets, 2 red capsules, and 2 yellow tabs. Using this 4 color coding system ensures that the accuracy of the ingredient dosages are maintained throughout the entire manufacturing process right up until the packs are sealed in air-tight canisters. The Anti-Oxidation Coating technology preserves the bio-activity of the ingredients inside the tablets. Without the use of this coating technology the oxidation of certain vitamins, minerals and nutrients would occur and their effectiveness would decrease. The Optimal Disintegration Coating technology ensures that the various ingredient layers of each tablet are released at the right point in the GI tract for optimal absorption. 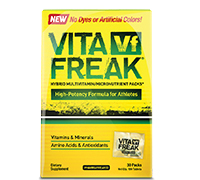 Directions For VITA FREAK PACKS: As a dietary supplement, take 1 pack daily to support your vitamin, mineral and essential micronutrient requirements. Warnings: Keep Out Of Reach From Children. Do not use if pregnant or nursing. Not intended for use by persons under the age of 18 years. Consult a physician before using this product if you have any medical condition, if you require surgery, or if you are taking any over-the-counter or prescription medication. Use only as directed. Do not exceed recommended serving, as improper use of this product does not enhance results. Store in a cool, dry place.